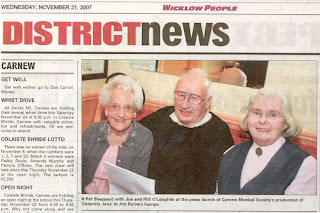 Mum and Dad are in this week's Wicklow People Newspaper. They are pictured (right) with Pat Sheppard, their long time very dear friend. This year also marks the 40th Anniversary of Carnew Musical Society of which both Mum and Dad have been active members since day one. Dad, along with other Society colleagues, was also recently interviewed on Wicklow radior station East Coast Radio. Unfortunately, ECR don't podcast their programmes and I missed the interview. Maybe I'll catch the 50th Anniversary celebrations! The picture was taken in Jim Byrne's Lounge which is on the Main Street in Carnew. You can't see it, but no doubt there is a creamy point of the black stuff on the table in front of Dad!